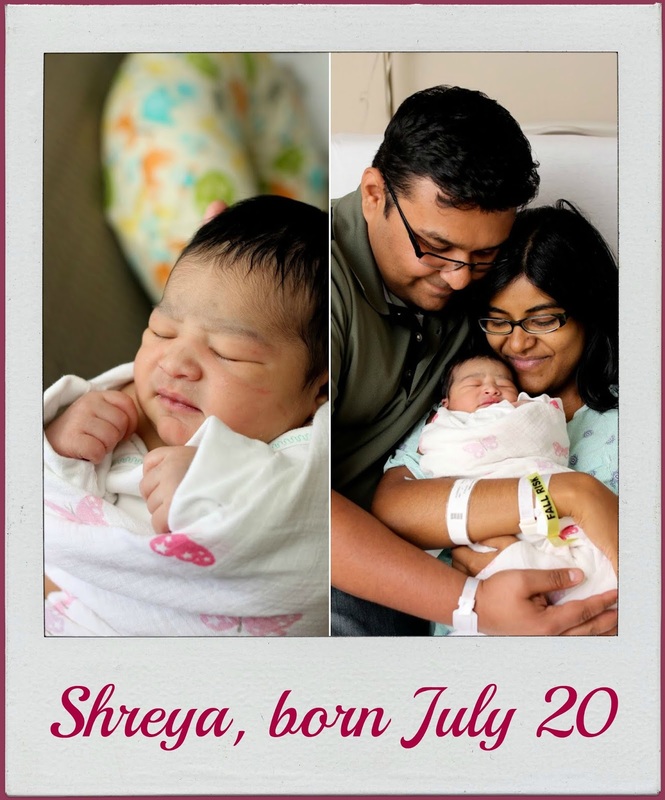 Shreya, at 8 lbs 1 oz and 21.5" tall, was born on July 20, after a very long labor. Already, she's slightly older than a week and I have become depressingly aware that time is going to fly and she is not going to be the same little peanut that she was even a week ago. Right now, I am exhausted. I have heard many moms use that word and although I believed it then, you need to actually experience this exhaustion to know what it really means. Looking after a newborn is tiring. It's also super rewarding especially when it's 3 AM and you are extremely sleepy but staring at you is this perfect pair of happy eyes that don't look remotely sleepy. I don't even remember the last night I slept properly but it was several days before I went into labor. I started getting timeable contractions at 11.30 pm on July 18. I had just put my knitting away, ready for a hopefully but unlikely good night of sleep when the first one hit. From then on, they started coming in 10 minutes apart. I may have gotten a half hour of sleep that night but honestly, I don't remember. By morning, the contractions were still painful and coming in 5 minutes apart. I told the husband and my family that I was possibly in labor. Everyone was now preparing for welcoming in the new one that night. That didn't happen. The contractions didn't get closer at all but they remained painful. I started knitting in between them, and walked a LOT that whole day. I also did every exercise in the book that claim to speed up contractions. By 9 pm on July 19, those stubborn contractions were still 5 minutes apart and I was getting super irritated. Although it was recommended to walk into L&D when the contractions were showing some kind of progress, I decided to go to the hospital anyways. There's only so much patient laboring a woman can do. I was secretly hoping that maybe I was one of those lucky ones who would be close to fully dilated even without very painful contractions. At the hospital, they told me that I was at 3.5. A whole day of laboring and that's where I was. I actually asked the nurse if she was sure. Surprisingly, they decided to admit me. They usually wait until you hit 4. I was glad. I didn't want to make the trip back home and continue laboring there. Plus, I was tired and sleepy. I continued laboring in the L&D room and by 3 am, I was only 4.5. I requested a painkiller-sedative that put me out for about an hour (man, I was talking rubbish as soon as I got that drug - it was fascinating and hilarious). But an hour later, I was back from bliss-land and now moaning through the contractions, which were still 5 minutes apart. By 10 am, I was a 5 and my obgyn recommended taking pitocin or breaking my water to move things along, or else I could be laboring for too long. Much as I hated the idea of taking pitocin and wanted to avoid it at all costs, at that point, I didn't need much convincing. I wanted this baby out. Until that point, I was laboring naturally. I wanted to continue doing that but I knew pitocin was going to make things... interesting. Sure enough, the contractions amped up in intensity, pain factor, and timing almost instantly. That was good news but the pain wasn't so I called in for epidural. The relief was instantaneous. I was finally smiling after a long time! Even with pitocin, I wasn't progressing as fast as I had hoped to. It was many hours before I was at 8, at which point, the doctor broke my water. From then on, stuff started happening. Fast. I was curious how the epidural was going to impact the pushing, but turns out I could do a lot. The epidural was wearing out and I could feel every contraction all the way through. Still took me about an hour of pushing to get her out. 46 hours after my contractions first started, she arrived! 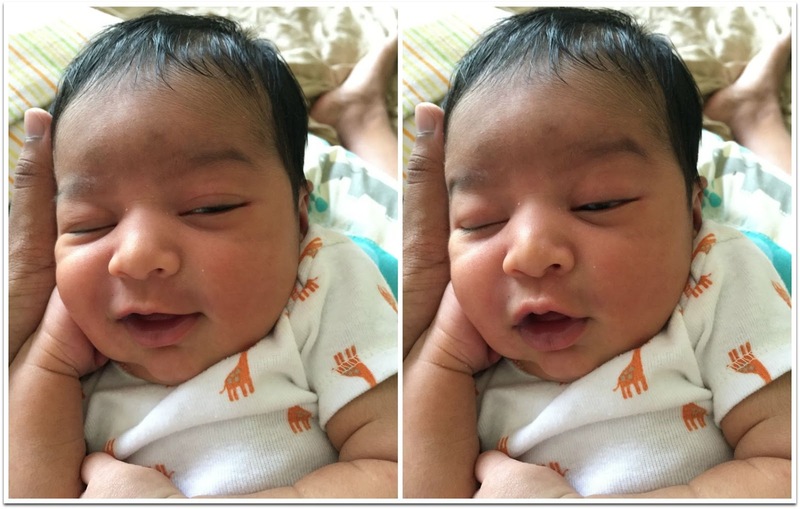 Honestly, the one week after delivery was the hardest part of the whole pregnancy and childbirth. I had a second degree tear and could hardly sit at all for a whole week. 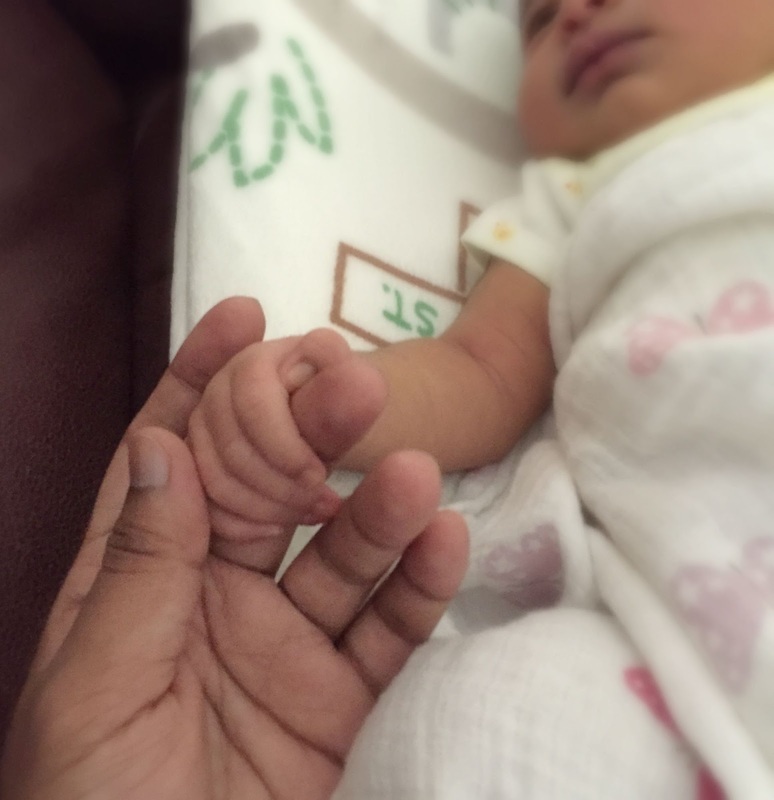 The stuff no one tells you about postpartum! Honestly, even I have mostly forgotten / blocked out the details so it's no wonder people don't mention this difficult phase much. I am hugely thankful to my mom for taking care of the chores and helping me build up my strength. The husband and I spent most of our time with the baby. Now, ten days later, I feel mostly fine. I still can only walk at a slow amble but other than that, physically I feel perfect. Now if only I could get some uninterrupted sleep. 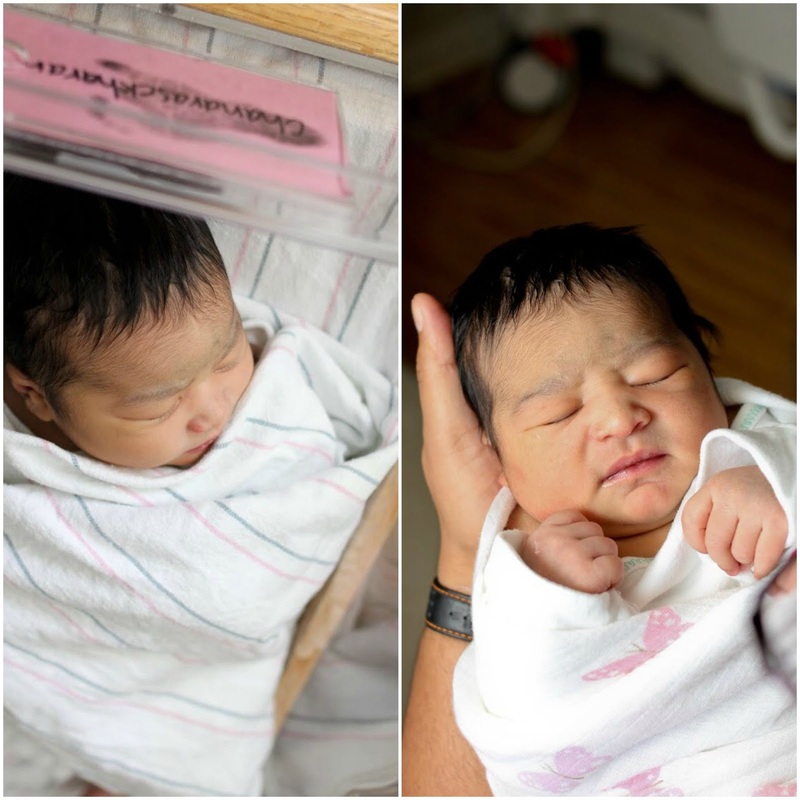 Ever since we got back from the hospital, Shreya has kept us up all night. She has got her day and night mixed up - she sleeps like a champ all day and then sits wide-eyed all night. Each day gets a little better for us as we try to figure out what works best for her and us. Last night, I did get a lot more sleep than during the previous nights and managed to wake up ready for the day, so fingers crossed! When I'm not drowsy or fighting a headache, I'm mostly admiring this little bundle. Newborn-gazing is my new hobby right now and I've been spending a good amount of time taking pictures. Already she looks very different from how she was a week ago. It's truly amazing how fast they grow.